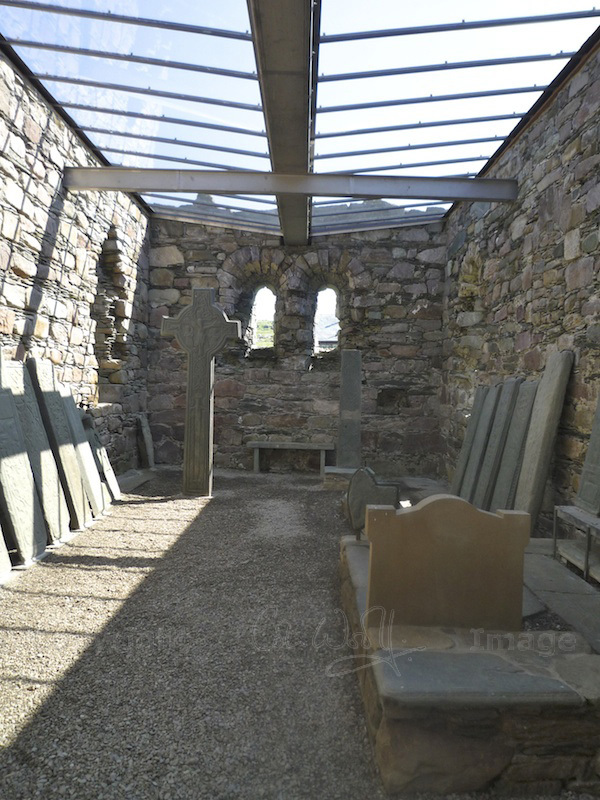 So, here we are, in the sunlit interior of Kilmory Knap Chapel, surrounded by a mesmerising display of medieval carved gravestones, just one of which would have been fascinating… but there are over 30! And while you are studying each stone in turn, reading the descriptions and trying to gain an impression of its owner, you are keenly aware of a tall and imperious presence, watching over you like a guardian of the chapel. 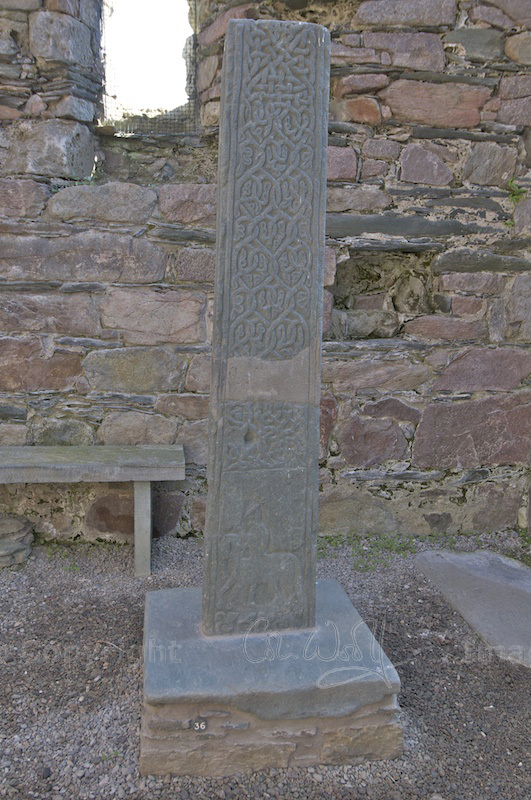 This is MacMillan’s Cross, and it dates from the 15th century – around the same time as the more elaborate grave slabs. The carvings on the cross head and shaft are so clear-cut and well preserved that at first glance I assumed it was a replica! Amazingly, it was only moved inside the chapel in 1981; earlier drawings show it in situ in the graveyard, leaning at an alarming angle as if someone had already tried to uproot it. One of the cross faces bears the scene of the crucifixion, with the Virgin Mary on the left and St John on the right. (I have no idea how they were identified – I’m relying on reputable sources here!) A magnificent sword is placed vertically below, between two lengths of woven patterns, plaited in different ways. On the other side is a kilted huntsman and his dogs, who are about to bring down a deer. I love the way the scene has been designed, so as to fit within the narrow confines of the cross-shaft. The huntsman stands above the words ‘hec est crux Alexandri Macmulen’ – ‘this is Alexander MacMillan’s cross’. 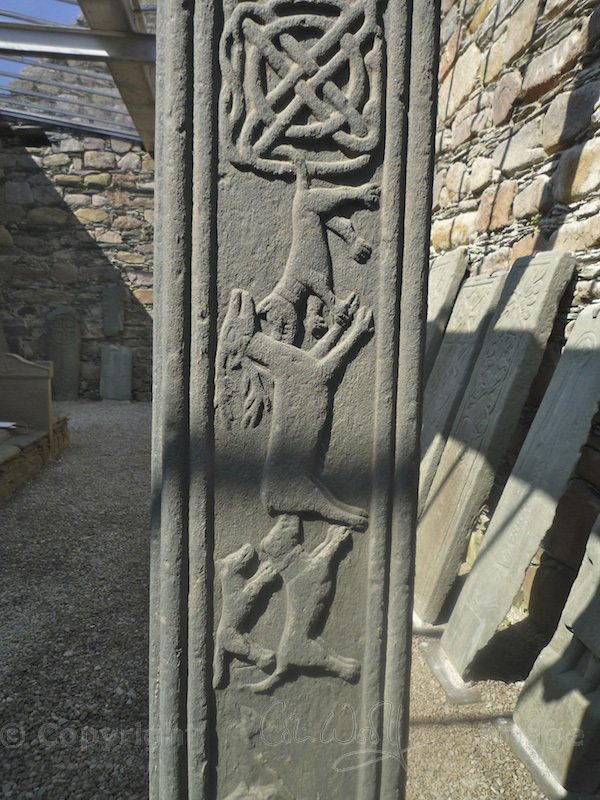 In the very centre of the cross is a tiny dog-like animal which appears to be chasing its tail. I’d love this to be Alexander’s favourite pet! I guess we’ll never know. 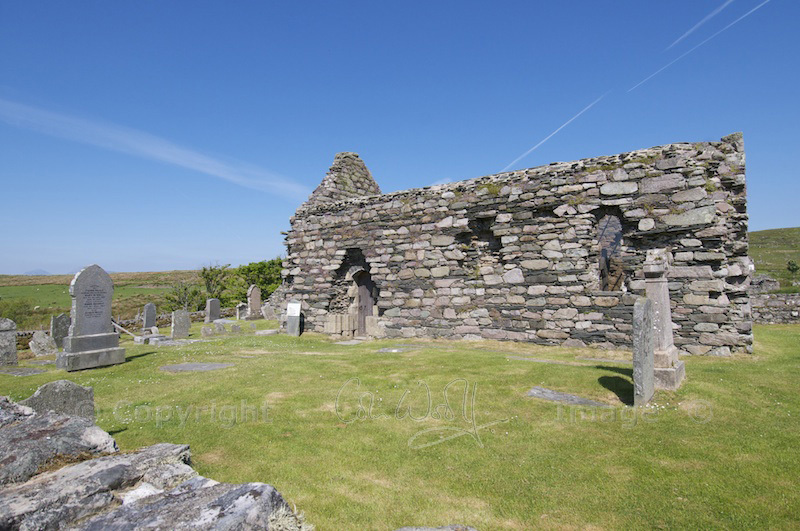 Alexander MacMillan was a prestigious landowner and the keeper of nearby Castle Sween, where he added an impressive tower in 1470; he and his family would probably have used Kilmory Knap Chapel for worship and for burials. Is he buried in the graveyard here? 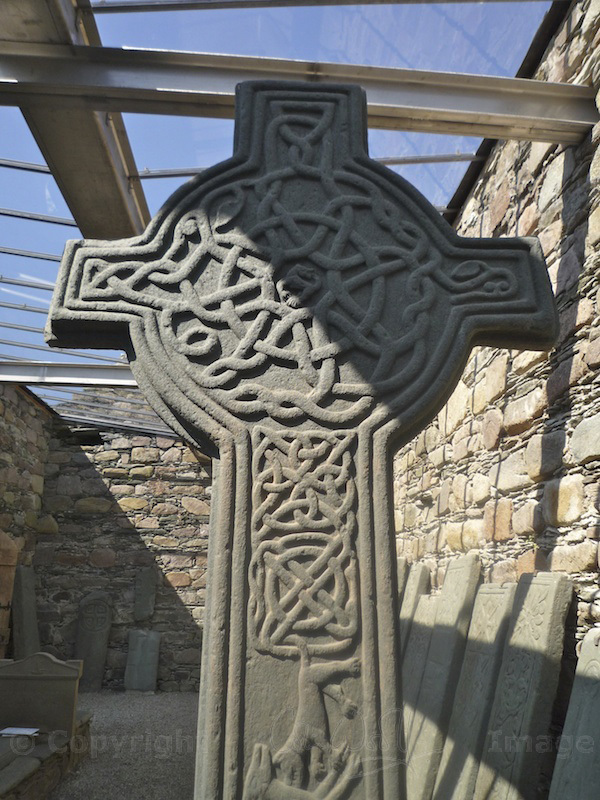 Impossible to say for sure – but he has left a wonderful legacy in his cross, which is considered to be one of the finest surviving examples of Celtic art in Scotland. And that is a very good point – just why has the cross weathered so little? 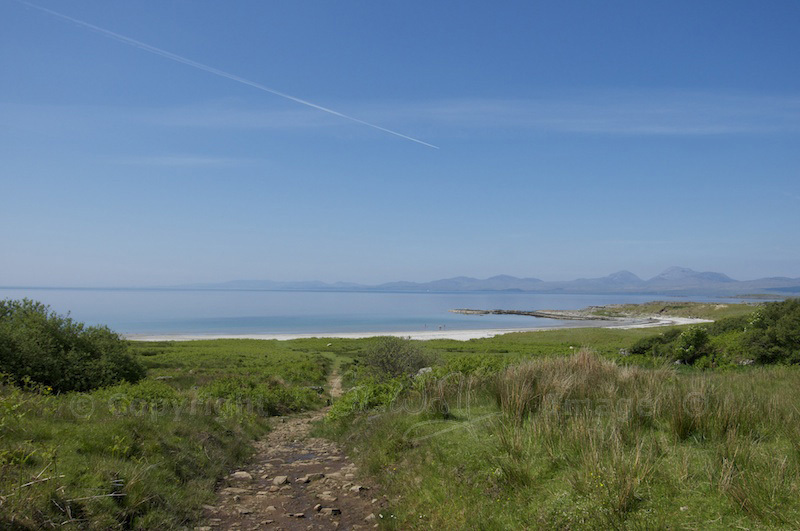 Just consider for a moment: it has faced a barrage of Atlantic storms for at least 500 years (and the rain certainly does rattle in across the Sound of Jura). But the carvings look almost brand new. I wonder if the rock is basalt, in which case it is extremely hard and resilient. If you’re a geologist and you recognise the type of rock, please let me know! Unfortunately, the words are no longer there, having been erased when Knapdale fell to the Campbells in the 17th century. 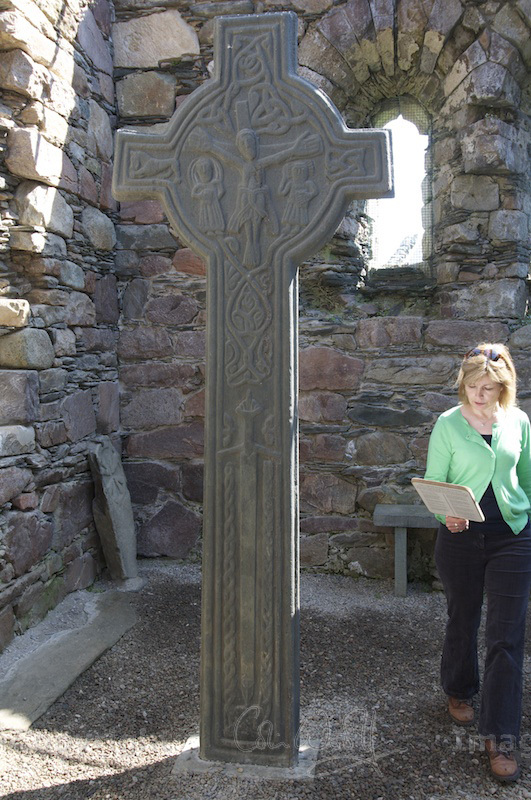 The fragments exist of a second cross, carved on Iona for Duncan MacMillan and his father, Malcolm, around 1505. I am unsure – but would love to know – in what way they were related to Alexander. The elaborate cross-shaft and a surviving section of the head show some remarkably beautiful carving. The information board tells us that: “At the foot of the shaft is a rider with a spear. Around him there was an inscription which was still legible in the 17th century.” What a shame the words have been lost. One source reveals that the cross head fragment had lain in a stream until recently, and I imagine that this is the reason for its discolouration. Now that I’ve read this, I really want to go back to Kilmory and look for the other bits! 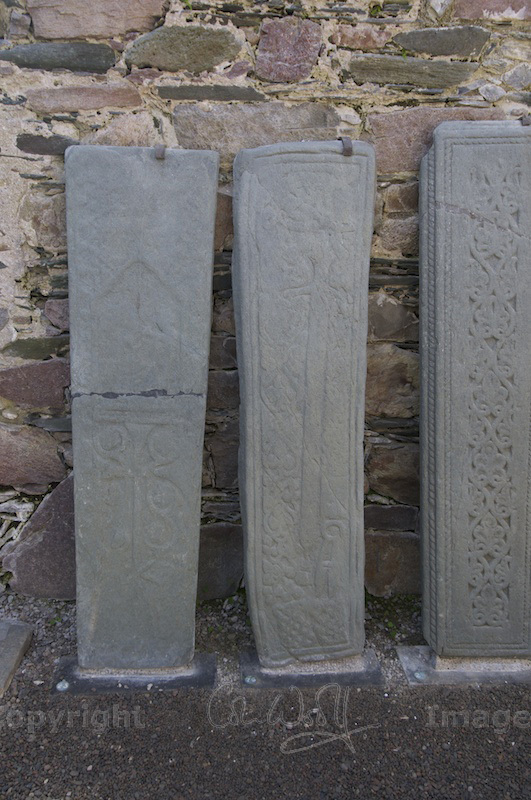 There is another connection with some of the grave stones here in Kilmory, but this one is veiled in mystery. I am about to mention the words ‘Knights Templar’, which in historical terms is probably akin to throwing a lighted match into a powder keg, but I’m intrigued, so I will carry on! In the early 14th century, after the last Crusade and the fall of Templar strongholds in the Middle East, the Knights were fleeing from the persecution of Pope Clement V. They had lost all their lands, and they were extremely unwelcome in both England and France. Meanwhile, in Scotland, Robert the Bruce had just murdered his rival, John ‘the Red’ Comyn, on the steps of a Franciscan priory. Pope Clement V promptly excommunicated the Bruce, and he also condemned everything Scottish, just to be on the safe side (no tartan shortbread for him that Christmas). Some of the Knights Templars are thought to have set sail from France, bypassing England to arrive in the east of Scotland and parts of Ireland. Here, they were safe from the wrath of the rather inaptly-named Clement. A few daring historians have gone so far as to suggest that, around the same time, Templar weapons began arriving in Scotland from Ireland; and that, having helped to equip the Scottish army, the legendary knights rode out with Robert the Bruce at Bannockburn. Whatever you might think of this theory, Loch Sween is just a short distance from the coast of Ireland; it would be an easy round trip for a galley, with little danger of interception. 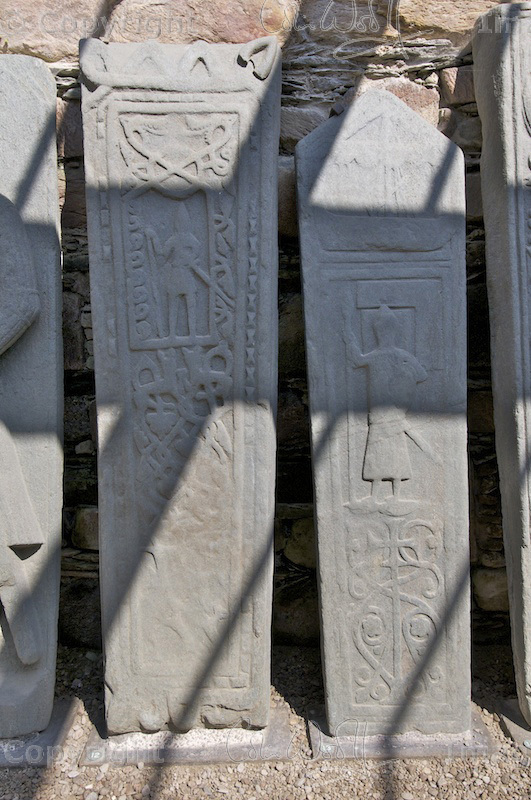 The skill of the Knights Templar was reflected in their carvings, and some of the stones in Kilmory Knap Chapel are thought to bear their hallmark. 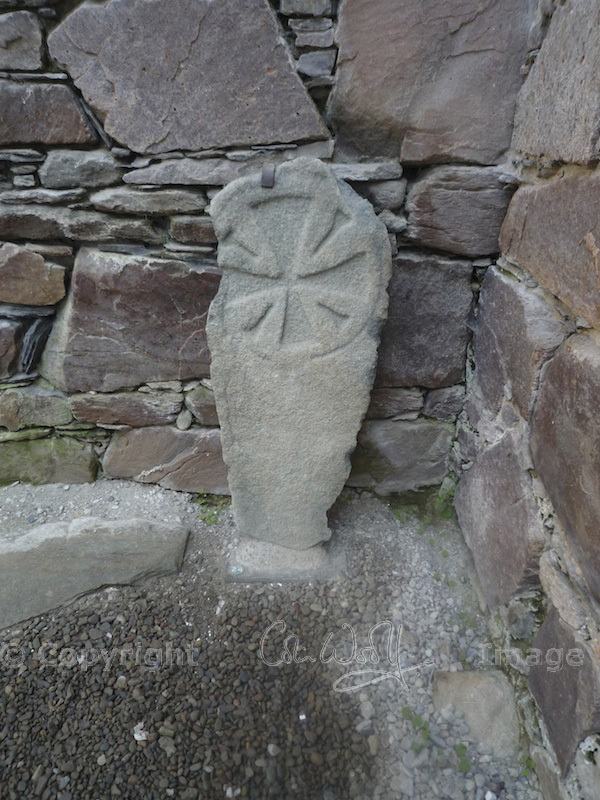 At least one stone is carved with what looks like a ‘cross pattée’, a style of cross with splayed ends which has been associated with the Templars, while another appears to show a set square, a symbol of the ancient order. I have chosen a few photos here and would be interested to know what you think. There is probably at least one book waiting to be written purely on the study of place names linked to the Templars, but it is interesting to note the existence of a ‘Temple Wood’ close to Loch Awe, where some of the stones are believed to originate. Again, I would emphasise that this is purely a theory. The presence of such symbols is not enough to prove anything at all, and they were not exclusive to the Templars in any case. I don’t really know what I would prefer to believe, and in the truest sense it’s irrelevant because the stones still honour the lives of real people, with real families and emotions, some good, some bad. I would like to think that they had happy times in Knapdale, that they loved its woodlands, its wildlife and its spectacular coastline. There must be few more beautiful places to call home. 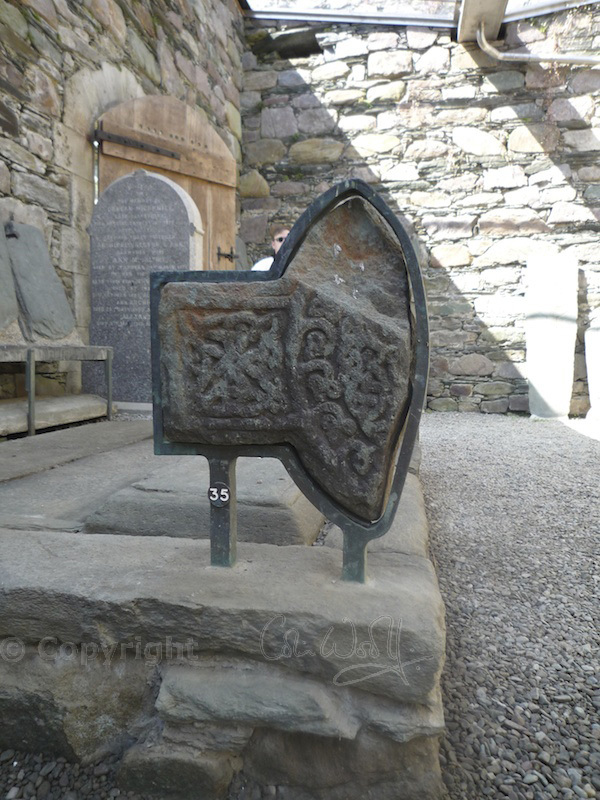 You can read the first part of my visit to Kilmory Knap Chapel here. Find out more about Castle Sween, Alexander MacMillan’s stronghold, here. 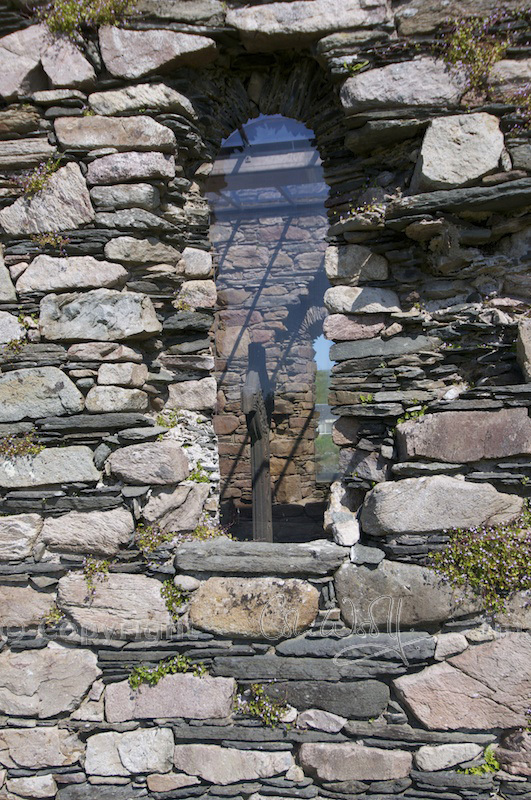 Kilmory Knap Chapel and MacMillan’s Cross are in the care of Historic Scotland. I was astonished by the first post and I’m even more astonished now! The detail on that cross is incredible. 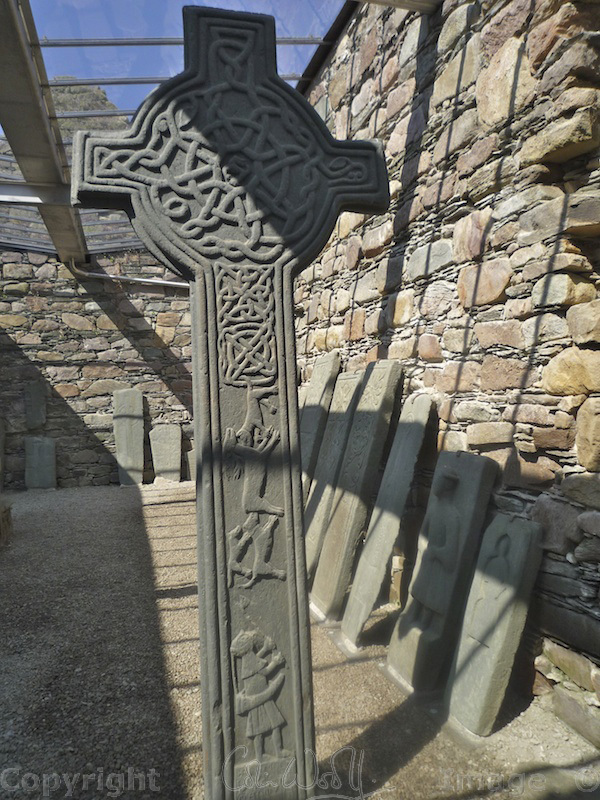 I showed your post to a geologist chum and he said that stone crosses are mostly made of a green chlorite schist from the Dalradian in south-west Scotland. This was originally basaltic ash before it was metamorphosed, so he reckons ‘basalt’ is almost correct (correct enough for me, but when it comes to basalt he is quite the pedant). I can see why you would want to go back and revisit after all your research; any mention of the Knights Templar brings an exciting dimension to a story. Your photos are wonderful, and I can’t get over the weather – perfect! Aha! 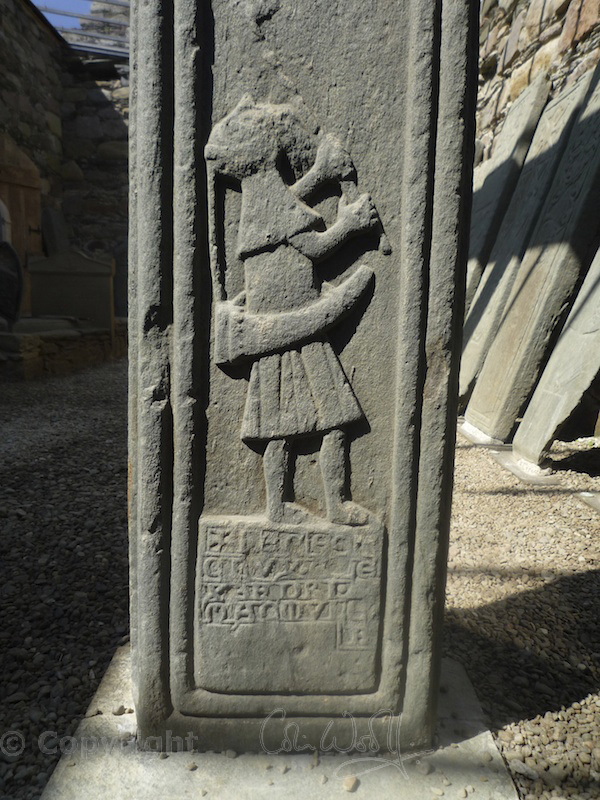 That sounds familiar – I have read that somewhere, I think it was in relation to one of the crosses on Islay. Please thank your friend very much, Lorna! And thank you, too! 😀 I am pleased to have solved that one. The whole place is just as astonishing as it is beautiful. I was never planning on making my posts on the Hazel Tree this detailed or lengthy, but there was no other way to describe Kilmory in sufficient detail or to convey the atmosphere there. Thank you very much once again! I am off to look up ‘green chlorite schist’ now! Could you provide a best guess as to the interior dimensions of this chapel? It seems rather small on the one hand, yet quite large on the other, especially owing to the presence of the MacMillan’s Cross. Probably about 30 feet in length, 12 feet wide, and the existing walls are about 12 to 14 feet high. It would have seemed much smaller without the daylight from the clear roof! I would say the cross stands at about 8 feet high, give or take a few inches. Okay so the cross is smaller than I thought. Lol Thanks!! Beautiful, beautiful, I am in heaven…or thereabouts! Loved the post, specially the intriguing historical perspective of the legendary Knight Templars that you have brought in. Your photographs of course transported me to my own travels in Scotland some years back. The lake district is indeed stunning, the lakes mysterious and one can quite appreciate how several legend including that of the Lochness monster came into being. Thank you! It is a very interesting story and I’m sure there is more just waiting to be discovered. It sounds like you really enjoyed your visit to Scotland. We do have plenty of legends – that’s one thing I love about this country! This is a very well known scene for Orthodox space but not only. Here, in Romania, every church has at least one icon like this with Christ, Virgin Mary and St John. There are many frescoes with them, also. Thank you very much for this, Cornel, I had no idea that this was a scene that was widespread in frescoes and icons. I will look into this now! Thank you for your blog and all the beautiful photos. I am a MacMillan descendant (my 3rd great-grandmother was a MacMillan born in Ireland and her parents came there from Scotland as part of a religious colony) I cannot tell you how much it means to be able to see and read about this piece of my family’s history. Perhaps I will make it there myself one day. We were there two weeks ago. McMillan bloodline. Wonderful place.